Not enough for what? Running the motors and the RPi from the same supply? No. Run the RPi from a different supply, or you will have a lot of trouble. The web site tutorial you are following is just showing you how to use the L293 to drive motors using a pi , for the example ordinary AA batteries are find because the load on the motors is minimal, once you start using the motors to actually move a rover about the load will go up which is when you might find AA batteries start to run down very quickly. you could just replace them with AA rechargeable batteries which will supply more current and can be recharged when needed. 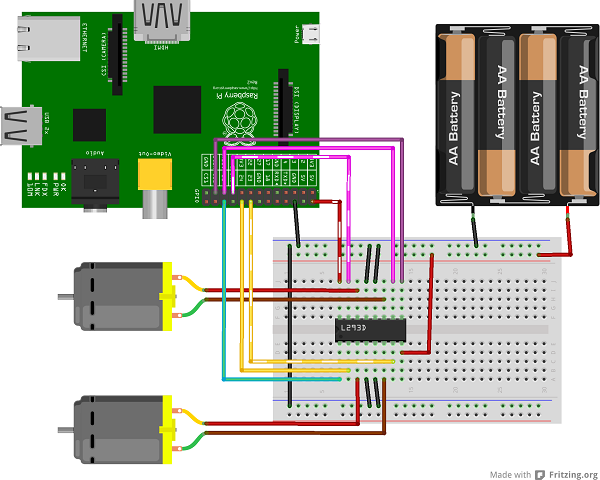 What would be a good power supply for the RPi? Would LiPOs be just fine? There are plenty of people powering the Pi in a mobile project from a LiPO power pack, but these are normally available in multiples of 3.6V, so you will need a 7.2V LiPO and then a voltage regulator to bring it down to 5V. Many 5V regulators work best if the input voltage is at least 7V, so trying to power the Pi from 4x1.5V AA batteries could be problematic. If you start using rechargeable batteries rather than disposables for the motors you will find that they can supply a much higher current (especially NiMHs), but the peak voltage is only about 1.2V instead of 1.5V. Hence to run a 6V motor at full speed you will need a 5x battery holder instead of a 4x. These are strangely difficult to get hold of. As well as a LiPO going directly to the pi? If you are going to use rechargeable batteries for your motor supply use 6 x 1.2v which will give you 7.2v. you will have a slight voltage drop across the L293D any way and most 6V motors will operate over a voltage range of 4- 8V without any problems. Last edited by pcmanbob on Wed Jul 11, 2018 11:05 am, edited 1 time in total. A USB battery bank if it can output 2+ Amps should be able power the Pi. DO NOT power the Pi directly from 7.2V. I've run a pi3B from a cheap powerbank with no problems. Although the powerbank is only rated 1A (as are most), it quite happily runs the pi for a couple of hours. Got it from argos for about £8 last year. Rated at 2Ah. And yes, use separate power for the motors is a good plan, although I've run lower power motors (micrometal motors) from the same powerbank with a pi zero and suitable decoupling. Not mentioned is the fact you can run a Pi off a single Lithium Ion cell with a boost circuit. This, in my opinion, is far safer. By using one cell, you can recharge it without having to remove it from your project or fiddle with complex balancing electronics. Additionally, if the boost module fails, your Pi will see 2.9-4.2v, which may be enough to run it until you can shut it down. Worst case scenario, your Pi crashes and potentially corrupts the SD card. If, however, you use 7.4v and buck it down, and that buck fails, your Pi plus everything connected to it, will see 7.4v, frying it all instantly. Last edited by Imperf3kt on Thu Jul 12, 2018 9:55 am, edited 1 time in total. Will this work?? or is the power from the AA’s also going in to the pi? Can we use circuit diagrams please? Here is the L293D datasheet: http://www.ti.com/lit/ds/symlink/l293d.pdf (there is an obvious error in section 6.3: for "Low-level output voltage" read "Low-level input voltage"). The chip uses a 5V supply for the logic, but fortunately the logic input voltages (section 6.3) are within the output voltage range of the RPi. However, you must not connect the chip's logic inputs to a GPIO pin that is not programmed as an output, because if the GPIO pin was in a high impedance state the leakage current from the L293D's inputs would cause the GPIO to exceed its safe voltage. That said, only engineers worry about this - hobbyists do it anyway and seem to get away with it (mostly). The main thing I need to draw attention to is Supply Voltage, where section 6.3 says Vcc2 must be greater than or equal to Vcc1. That means you should not let your battery voltage go lower than 5V. I don't know what will happen if you do, but it is not guaranteed to work correctly (again, you may get away with it, but an engineer wouldn't try). Last edited by Z80 Refugee on Thu Jul 12, 2018 5:19 pm, edited 1 time in total. An obvious omission: where are your back-EMF protection diodes? See the diagrams in section 9.3.2, Figure 10 describes your particular usage. Without the diodes, you could destroy the L293D. The device in the picture is L293D which has the diodes in-built. No guarantee that the OP is using that rather than plain L293 without the diodes, particularly as he's not using a Pi with only 26 pins, despite what the picture shows! My reading of the picture is that the 5v (red-white dotted) is only connected to the L293D pin 16, nowhere else. You can get 5 (and 10) battery holders, but I have only ever seem them as ebay items shipped from China. I have a couple, purely for 6V motors, but I might measure the voltage drop across the controller (a L298N in my case, because I have a few around) and maybe go to 6x. Oh yes, so they are. Thanks. WILL THIS PINOUT OVERLOAD MY PI? L293d pin 16 > RPi 5V #<<< this be problem if I am using a LiPO (boosted to 5V) directly to the pi?! this be problem if I am using a LiPO (boosted to 5V) directly to the pi?! The problems you might encounter are if the battery voltage drops below 5V, or if the motor currents are too high for the breadboard (or the contact between the wires and the breadboard). No, this is as simple as it gets. One IC, two motors, and a power source! Nobody should ever be designing in an IC (or even a transistor) without being familiar with its data sheet and checking it is capable of doing what you want and what requirements have to be met. That's the basics of electronics design. Diagrams are much easier for us (and will be for you) to understand than wiring lists or pictorial representations, and what you've listed is what I drew above (apart from adding GPIO allocations - and it would be better to use GPIO numbers rather than pin numbers or function names ("MOSI" is irrelevant to your usage). Including diagrams isn't hard - I sketch on my iPad, but a sketch on paper then photographed would be just as good. Incidentally, you don't actually need to connect pins 1 and 9 to GPIO outputs, they could just go to 5V. The same effect (cutting the current through the motor) can be achieved (in your configuration) by making the inputs both high or both low.